The eBook edition of Planet of Cities is now available. This is a modified excerpt from Chapter 12 — From Centrality to Dispersal. Between 1810 and 2010 Buenos Aires made a transformation typical of many global cities. It shifted from a walking city to a monocentric city to a polycentric city, driven primarily by changes in transportation technology. In 1810, the city’s population of 45,000 occupied some 200 hectares at a density of 225 persons per hectare. Life centered on the port and people primarily got around on foot. The city thrived on a combination of commerce, banking, trade, and its position as the seat of the federal government. By 1869, the city had 171,000 residents and an area of 714 hectares. The average density in the historical center remained the same, but density declined rapidly with distance from the center. The omnibus—a multiseat carriage pulled by horses on unpaved roads—was the major form of public transportation but it did not extend much beyond the walking city perimeter. The omnibus notwithstanding, Buenos Aires remained a predominately walking city. People who worked in the city center typically lived there as well. The mid-1860s saw the introduction of the horsecar—a horse-drawn carriage pulled on rails. Horsecars were substantially faster than omnibuses, allowing the city’s perimeter to expand even as they reinforced the dominance of the city center. 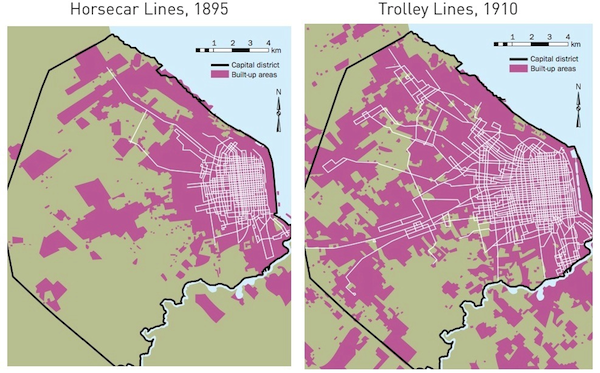 Horsecars transformed Buenos Aires from a walking city into a monocentric city. The city extended its administrative boundary in 1888. The wide Avenida General Paz formed the new city limit and the area 207 sq km within it became known as the Capital District. By 1898, the electric trolley began to replace the horsecar, greatly extending the reach of public transportation into the urban periphery. Compared to horsecars, the trolleys were faster, more reliable, and operated for longer hours (Sargent 1974). Railways extended the commuting range during this period as well. “The number of inbound daily trains to Buenos Aires increased from 306 in 1898 to 751 in 1914,” and the number of passengers increased fivefold during this period (Sargent 1974, 69). The steam-powered trains of this era were more suitable for lines with long distances between stops, but their increased frequency made land adjacent to stations more attractive for commuters, especially those coming from destinations beyond the reach of the trolleys. By 1910, the population of Greater Buenos Aires increased to 1.41 million and its built-up area increased to 255 sq km. The electrification of the railroads in 1916 enhanced the dispersal of Buenos Aires even further. The electrified railroads dominated the development of the suburban alrededores. “Passenger volumes in the alrededores rose sharply from an estimated 6,400,000 in 1896 to 82,000,000 in 1930” (Sargent 1974, 96). By the end of the 1930s, the expansion of residential suburbs followed the railway lines into the periphery. 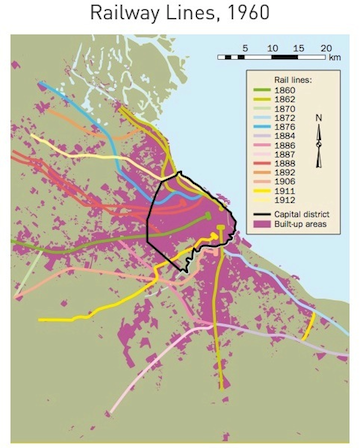 As long as workers relied on radial transportation lines to commute, Greater Buenos Aires remained a monocentric city. But as early as the 1930s, the shift to a polycentric city was underway. As the wider spread use of cars and trucks increased congestion and lengthened commuting times into the Capital District, industrial plants began to relocate from the center into the periphery. Between 1935 and 1994, the share of industrial jobs in the Capital District decreased from 80 percent to 37 percent. By 2001, the population of Greater Buenos Aires was 12 million and its built- up area had reached 2,071 sq km. The Capital District had a population of 2.8 million and a built-up area of 165 sq km. By 2010, the share of trips in Greater Buenos Aires that had the Capital District as their destination decreased to 18.6 percent, of which 6.6 percent originated in the district itself. In other words, more than four-fifths of all destinations by transit were in municipalities outside the Capital District. The center no longer held its dominant position in the city’s life. The Capital District continues to provide a large number of jobs and residences, but by 2010 Buenos Aires was a decidedly polycentric city.